Laura, now pulled back into everything she left behind when she died—her old high school and memories of her life and death—has been in training for this exact moment. And nothing means more to her than succeeding at her assignment. Crossing the Line is available for purchase in print and as an ebook at Amazon, Barnes & Noble, and IndieBound. To win a copy of Crossing the Line, please enter using the Rafflecopter form at the bottom of this post. The giveaway contest closes Sunday, April 29th at 11:59 PM EST. We will announce the winner the same day in the Rafflecopter widget. Good luck! WOW: Thank you so much for being here and thanks for choosing WOW! Women on Writing to help promote Crossing The Line. When you first approached me, you mentioned WiDo had steered you toward WOW! - can you tell me more about how you partnered with WiDO and what that process has been like? What would you say to another author considering going this route? Ellen: It’s really been wonderful working with WiDo Publishing. There are so many options in the publishing world today. Ten years ago, I self-published my first book, a middle grade novel, and that was a great learning process. I still had this dream of getting a publishing contract, though, so the second time around, with Crossing the Line, I set my mind on giving that my best shot. That meant first and foremost, polishing my manuscript before sending it out. I solicited feedback and rewrote it. Then I hired an independent editor and rewrote it. Got some more feedback and rewrote it. You get the picture. That was half the battle. Then there’s researching the right publishers and agents for your work and crafting a good query letter. I will say that my membership in the Society of Children’s Book Writers and Illustrators (SCBWI) helped a lot with that. The last element is the magic fairy dust because there is this intangible, indescribable piece that involves right timing, right place, right person. As a believer in the magic of the Universe, I do feel that it was no accident that I stumbled on WiDo’s website when I did. I resonated so much with their mission statement and felt my book was a perfect fit. I was at the point where I was about to give up on the publisher idea and self-publish again when WiDo expressed interest in reading the manuscript. I was so excited and the day they offered me a contract was truly a dream come true! From there, we went into the editing process and wait for it… more rewriting. I do think that is one of the hardest things in the process – having to read your book again and again. And yet, I will tell you that my editor, Shantell Booth, was wonderful and made what could have been painful, quite painless. Having self-published before and having full control, I was a little worried about what I might be “forced” to do my story. There was none of that with WiDo, just great suggestions and guidance that improved the book. They really allowed me more freedom and creative control than I expected. I don’t think that’s the case with all publishers, so that reinforced my decision to go with WiDo. The editing process took a bit longer than I expected, but then we got to the fun part – creating the cover. WiDo took my input and I was actually shocked that they came up with a cover I loved from the start. What would I say to other authors wanting to take this route? This path takes persistence and patience. To increase your odds of getting a publisher, you have to put your best foot forward. Don’t send out your first draft or your second draft. Take your time, get honest feedback, professional editing if you can, and submit a well-crafted, clean manuscript. Then do your research and only send to those publishers or agents who are looking for your genre/style. And don’t forget the pixie dust. Seriously, sometimes that pixie dust is as simple as believing in yourself and not giving up. WOW: Believing there are enough hours in the day seems to be a stumbling block for many of us. Throw a little of that pixie dust my way. But seriously...time management seems to be quite a challenge for all of us, but you're a journalist, novelist, coach, speaker, volunteer, and teacher. Oh great one, please teach us your ways? How do you balance it all and still manage to have such great hair? Ellen: I love this question for so many reasons! First, let’s be honest. The hair does not always look like it does in the headshot. I’ve worked at home for more than 20 years and the best part is not having to worry about what you’re wearing or what your hair looks like before going to the “office.” My work attire is often shorts, t-shirt, hair pulled back, no shoes. I love it! The other side of this question, about balance, I take very seriously, or at least I’ve learned to take more seriously over the years. First of all, I will admit that I don’t do all of those things at the same time. As a freelance journalist, you get and take assignments as they come and you can be as busy or not busy as you want. Over the last few years, as I’ve dedicated myself to writing and editing the book, I took on a little less freelance work and also did less of the volunteering and teaching. Here’s what I really want to share. It’s so easy to get overwhelmed, especially when you have young children. I just became an empty nester so that changes everything. But my best advice about balance and managing time is to be dedicated to taking care of your own mind, body, and spirit first. I realize people will say that’s not as easy as it sounds, and I get it. I only know from my personal experience that when I’ve taken time to meditate, exercise, journal, or whatever it is you like to do for yourself, I am able to more easily handle everything and everyone that pops up in my day. On the other end of that, I know when I caught up on the crazy train of life just doing, doing, doing, I end up exhausted, stressed, and sometimes even sick. Everything goes better when you make yourself and how you feel a priority. One last truth on this: it took years to complete each of the books I’ve written. Maybe that’s because there were other things vying for my attention at times, or maybe it was just procrastination. Or maybe I also took time to enjoy life and my boys while they were still here. It’s all good any which way. I like to compare it to my attempts at running/jogging. I may not be the fastest (I’m very slow! ), but I keep going, pace myself, and still manage to make it to the finish line all the same. WOW: Such great advice - thank you so much for giving us a glimpse into your life. Let's take that a step further: What does your writing space look like? What advice would you give others who may be needing some help with creating a creative space? Ellen: This is another fun one. Part of me says, yikes, don’t answer this. That’s the part that doesn’t want you see my “creative mess.” Aren’t all creative people a little messy? So yes, there are some piles and messy stacks that need to be gone through, but there is also some fun, inspiring stuff, so let’s focus on that. I do have a room in my home that is my “office” for writing. I love nature, so I made sure my desk and computer are situated so that I can look out my window and see the canal and trees in our backyard. Today lots of dragonflies are buzzing around and I saw a few ibises and a hawk who stopped for a rest in one of the trees. Zelda, our cat, also loves to come to the window and pounce on the lizards that taunt her from the other side of the glass. Inside, I’m surrounded by my favorite things: shelves of books, artwork and writings from my kids, photos of my kids and family, stacks of journals (completed and ongoing), lots of angel figurines, crystals, angel card decks, special cards/gifts from my husband and friends, awards for my first book, and pictures and words that inspire me. A little peek into some of the current things I’ve chosen to put in front of me at the moment: the bottom portion of a card with a quote from author Paulo Coelho (one of my favorites) that reads, “Just as you are transforming your own life, may you transform the lives of those around you.”; two cut-outs from a magazine that say “Own it!” and “Dream Big”; and the Playbill from Hamilton, which I saw with my son Michael about a year ago and is a treasured memory. So I think you get my idea of a creative space. It should be a space that feels wonderful, inviting, and inspirational to you. And even though I joked about the messy creatives, cleaning up those piles and clearing out old stuff every once in a while, does wonders for getting the creativity flowing. If you ever feel stuck, clean! WOW: There have been so many take-aways in this interview so far. I know our readers really appreciate how open and honest you are. Being honest with other is one thing, but how honest are you with yourself? What advice would your current self give to your younger self when it comes to writing? life? publishing? Ellen: On writing, life, and publishing – Don’t take yourself too seriously. Have fun. Enjoy the process. You don’t have to be perfect. Everything always works out okay. I want to add that I started to answer this question in reverse, and I think that’s important when it comes to the writing part, especially since I loved to write from a very early age. So, my younger self would like to tell my current self to always remember what you loved about writing, how you did it for fun, just because, and it didn’t matter what anyone thought about it. WOW: I love how you spun that last question. Maybe it's our younger selves that have all the wisdom! I'll have to ask that question both ways in the future. Thank you! One last question before we head into this exciting tour of Crossing The Line. Do you belong to any book clubs or writers clubs? Why or why not? Ellen: I have belonged to a book club for about eight years. On top of the great camaraderie and delicious food and wine, I’ve enjoyed reading books that I might have not otherwise chosen on my own to my read. They say to be a great writer you have to read a lot and being part of the book club has probably gotten me to read more and helped me explore different kinds of writing styles. It’s also interesting from a writer’s point of view to hear my friends’ reactions to different authors’ approaches. It’s certainly helped me realize that opinions on books are incredibly subjective. As mentioned earlier, I am member of SCBWI. I’ve also been a longtime member of the Florida Authors and Publishers Association (FAPA). It’s so important, especially for us lone wolf writers, to get out and mingle with other writers. I’ve learned so much and have gotten so inspired by being in the company of other aspiring writers and successful authors. WOW: Thank you again Ellen. This is an interview I hope all our readers have an opportunity to read at least once. Your Tweet Tour has been a blast and I can't wait to hear from all the reviewers in the upcoming weeks! You've been a joy to interview and work with. Thank you! Nicole Pyles reads and reviews Crossing the Line by Ellen Valladares. This is a fun young adult novel that readers will be sure to delight in! Beverley Baird reviews Crossing the Line by Ellen Valladares. Readers won't want to miss this fast paced young adult novel! Ellen Valladares pens today's guest post at Kathleen Pooler's Memoir Writer's Journey. Don't miss this great post titled "Your Writer's Purpose -- how creating your purpose/vision can keep you on target" and learn more about Valladares latest novel Crossing the Line. Mary Jo reads Ellen Valladares Crossing the Line and shares her thoughts with readers at Write Like Crazy. Anjanette Potter delights readers at Bookworm with her review of the YA Novel Crossing the Line by Ellen Valladares. Brandi at Spark the Wizard shares her thoughts in a review of Ellen Valladares novel Crossing the Line. Wisconsin entrepreneur and school teacher reviews the latest novel by Ellen Valladares. Don't miss this opportunity to find out more about the YA Novel Crossing the Line. Today, at Finished Pages, readers have an opportunity to learn more about Crossing the Line the latest novel by Ellen Valladares. Don't miss Renee's review of this YA Novel! Eric Trant reviews the latest novel by Ellen Valladares. See what Eric thinks of Crossing the Line and find out more about this great book and accomplished author. Phy reviews the delightful YA Novel Crossing the Line by Ellen Valladares. 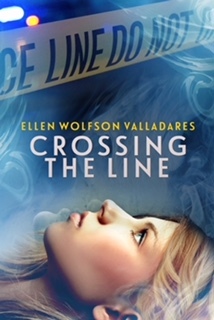 Today at Write Happy, Catherine Brown will be interviewing Ellen Valladares about her latest novel Crossing the Line. Don't miss this opportunity to learn more about this YA Novel as well as hear some tips from the accomplished journalist and author Ellen Valladares. Crystal J. Casavant-Otto from WOW! Women on Writing reviews Crossing the Line by Ellen Valladares and shares her thoughts with readers at Valladares blog. Brittany shares her thoughts after reading Crossing the Line by Ellen Valladares. Don't miss this insightful blog stop for this delightful Young Adult Novel! Don't miss today's guest post at Hott Books! 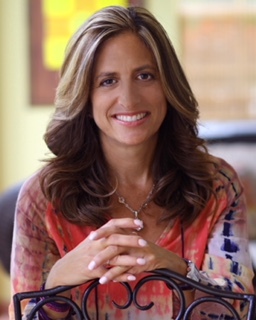 Distinguished author Ellen Valladares shares her post titled: 'The Inspiration Behind Crossing the Line'. You'll want to learn more about this delightful YA Novel! Melanie at Frasers Fun House reviews Crossing the Line by Ellen Valladares. Elizabeth at Word Nerd reviews the latest novel by Ellen Valladares. You won't want to miss a minute of this captivating YA Novel Crossing the Line. 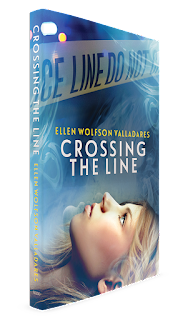 Anjanette Potter reviews Crossing the Line by Ellen Valladares and shares her thoughts with readers at BookWorm! Young reader Elizabeth shares her thoughts about this intriguing tale. Enter to win a copy of Crossing the Line by Ellen Valladares! Just fill out the Rafflecopter form below. We will announce the winner in the Rafflecopter widget on Sunday, April 29! So excited to kick off this blog tour here Crystal. Great interview. I really enjoyed answering the questions. I'm happy to answer any readers' questions here! You've shared such great advice in this interview. A doctor once told me that if one thing in your life gets out of balance or left out, it can impact your health, so taking care of your mind, body, and spirit and taking time to play (her words) is essential. And writing is part of that! It's fun, and we have to remember to write for fun as well as work and deadlines. Your book sounds fascinating and I'm looking forward to reading it. Good luck on your tour! You have some fantastic stops! Thanks so much Angela! Yes, the fun part is so important too. I have to say I've been having a lot of fun with this launch, celebrating a dream come true and connecting with readers and writers! My favorite is young adult novels and this book looks enticing. Thank you for hosting the giveaway! I love hearing from early readers of Crossing the Line - they keep saying the same thing - "I can't put this book down" and "this is such a great book!" Thank you Ellen - for choosing WOW! I LOVED the book and can't wait to host you on the tour! Your writing has inspired me as an inspiring YA writer who loves paranormal mysteries. This book looks exciting! Thank you for the chance to win! This is a great interview. Ellen is so articulate! I found another book to add to my list. Thank you for the giveaway! I am intrigued! I so want to read Crossing the Line! I'm about five chapters in. It's pulling me away from writing....full of surprises. It sounds like a great read. Do you have ideas for another book?